Trained by HADRA Festival Association TRANCEMISSION 2016, Goss proposes DJ sets exploring several music styles such as Psytrance, Hardtek, Raggatek, Acidcore, Tech-house and Techno. In 2017, Goss came back to Saigon, a city he studied in before, and started building with his brother Flo what would become ARCAN. At the same time, Goss, was getting first recognition as DJ and party organizer. After touring for 2 months in Vietnam and Cambodia, Goss worked as resident DJ and organizer for Spirit Of Nature at May Cay. Since then he organised and DJed for several venues in Saigon such as Piu Piu, Last Call or Lighthouse and Broma. His artistic signature is his unusual and strong powered music selection and awesome mixing skills. With a decade as the chief psy-physician of Radio Schizoid, she has unearthed and developed a vast audience in the underground radio electronic circuit. Currently based in Vietnam, you’ll find Cray organizing radio shows and running those sly psy-beats. Her performance history emerges out of 10 years of firing up a wide range of styles from progressive psy-trance to chill-out and ambient. tới cho các bạn một danh sách rộng lớn về Psytrance hoà lẫn với giai điệu Full on và Goa Trance. Nếu bạn biết hoặc thích những nghệ sỹ như Vini Vici, Neelix, Infected Mushrooms, Montti or Talamasca...vv và vv. Hãy đến với chúng tôi và quay cuồng theo Psy-Gon ở Arcan. 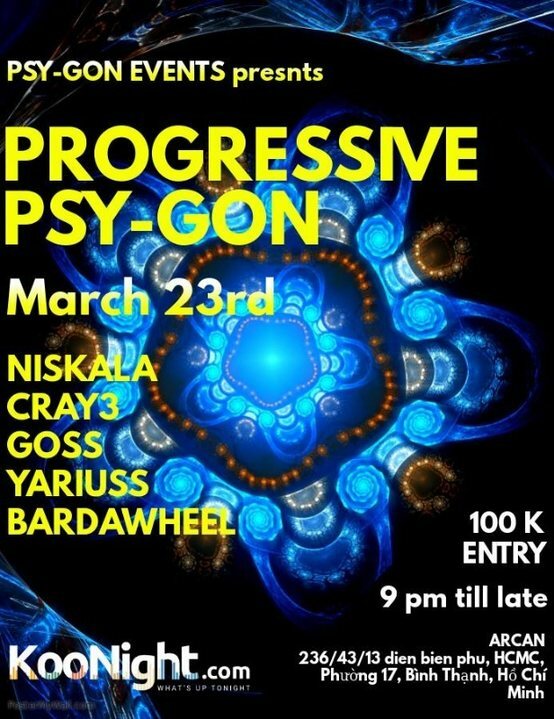 Progressive Psy-Gon is the new event series presented by Psy-Gon Events for all lovers of the melodic side of Psytrance...big drops combined with catchy hooklines and driving basses will make your mind spin and your feet stomp. Every first Weekend of the Month, our DJs are keen to present you a wide selection of progressive Psytrance and melodic full on and goa trance. If you like artists like Vini Vici, Neelix, Infected Mushrooms, Montti or Talamasca etc., come over and let your mind and body get lost in Psy Gon.